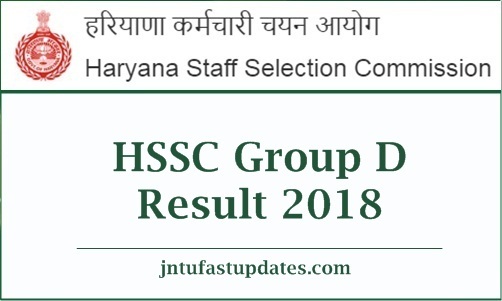 Haryana HSSC Group D Results 2018-2019: Haryana Staff Selection Commission (HSSC) conducted the Group D examination on 10th, 11th, 17th, and 18th November 2018. A large number of competitors applied for Haryana Group D posts have competed for the examination. The Haryana SSC has conducted the written test in many examination centers across the state. A huge number of competitors have clashed for the HSSC Group D examination can wait for the results. The organization is expected to release the results in the month of December (approximately). Hence the competitors have to wait for the result date; keep checking the HSSC official website, hssc.gov.in for the update regarding the result. The HSSC will give the information regarding the results on its official Website. Candidates can also expect the cutoff marks, merit list at the time of result. Haryana Staff Selection Commission has released Final Result & Allocation List for Group-D Exam Advt. No. 4/2018 Cat. NO. 01. Haryana Staff Selection Commission (HSSC) is the state government authority that monitors various associated organizations. HSSC annually releases various recruitment notifications to hire suitable candidates for various designations in the Government offices. This year the HSSC has released the notification for a large number of group D posts. As per the notification, the announced posts are 18,218. The vacancies include Peon, Beldar, Helper, Mali, and Cook & Others. The application process was started on 29th August and 18th August. Lakhs of aspirants have applied for HSSC Group D posts this year. The Haryana SSC selects the candidates based on their merit in the selection process. To screen the candidates, the organization is going to conduct the written test and interview rounds. Whoever qualifying the selection process with good merit will be shortlisted for the announced posts. All the competitors competed for the Group D Examination in the state of Haryana can download the result from HSSC website, hssc.gov.in. The result is released on January 20th,2019. The HSSC Group D result, the scorecard will be released. Aspirants can stay checking the HSSC website on a frequent basis to download the result. On the basis of Written Examination and socio-economic criteria and experience and online (computer based) scrutiny of documents for the post of GROUP-D of Various Departments/Corporations/ Boards etc. , Against Advt. No.04/2018 , Category No.01, the Commission has finalised and declared the result. The result has been shown Roll No. wise and category wise and the marks secured by the last selected candidate in each category have been shown in the bracket. How to download HSSC Group D Results 2018 Online? Candidates have to visit the HSSC website, hssc.gov.in first. In which, search for ‘HSSC Group D result 2018’ link and tap on it. HSSC Group D Result, Scorecard will be downloaded on the screen. Also, the aspirants can check HSSC Cutoff marks, and merit list over there. The organization will release the cutoff marks and merit list of the conducted examination at the time of result announcement. Aspirants scoring the minimum cutoff marks/qualifying marks in the examination are said to be qualified in the written test round. The organization will announce the HSSC Cutoff marks category-wise. Candidates can check the HSSC Group D Expected cutoff marks from the following. 1.2 How to download HSSC Group D Results 2018 Online?